It’s been a crazy busy week! One of the highlights is that two days ago I made my first live TV appearance. San Diego Living asked me to come and do a segment on fruit decorating. On Monday, July 3rd i spoke to the segment producer and the very next day, I was on TV. Since it was July 3rd, I showed a couple of red, white and blue 4th of July ideas. I was instructed to keep it very simple so that the hostess, Kristen Mosteller could make something along with me in the short time of the segment. Getting prepared for the show was a little nerve racking. (I was also preparing for a big 4th of July party at our home the next day.) Because it was a new experience for me, I didn’t quite know what to expect. But nerves turned out to be unnecessary. When I got there, the segment producer Tiffany, the hosts Marc Bailey and Kristen Mosateller as well as the crew that I met made me feel welcome and comfortable. Once we were under way, it was fun. And quick! Four 1/2 minutes felt like 2 minutes. One of the things that I found interesting is how the whole show seems to run so efficiently. There were 4 different studio sets in one room and they just whipped right through all the different segments one after the other. I guess that’s what live TV shows are all about. It was interesting to see, and be a part of. To to see the short 4 minute segment, click on the video below. 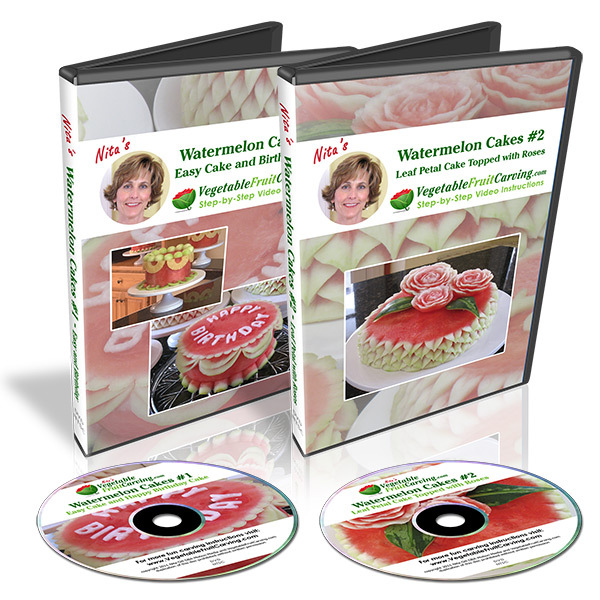 If you want to see the free lessons that I mentioned on the show, you can see the 4th of July ideas here. To get a closer look at the carvings and to see our party the next day, click here. To see a later segment of me about carving Halloween pumpkins on San Diego Living , click here. Congratulation on your TV appearance. It did not show you were nervous. You did great! You can learn ideas from my many blog post on this site. 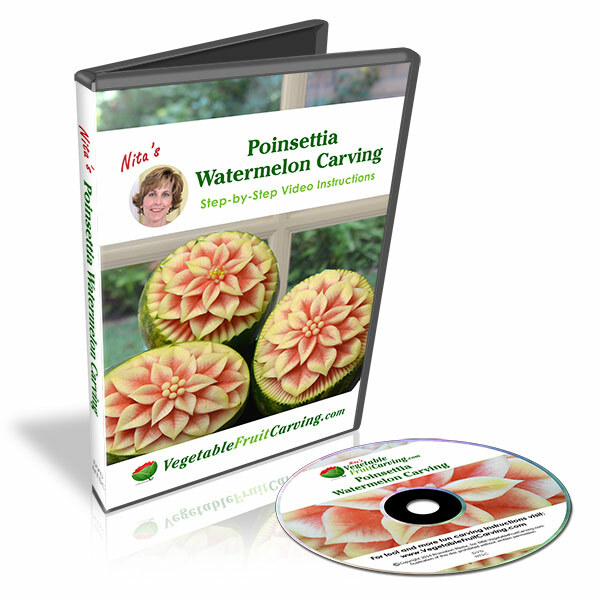 You can also get detailed step-by-step lesson in my online shop at http://www.vegetablefruitcarving.com/shop. Spanish translation below. Usted puede aprender las ideas de mi blog a muchos en este sitio. 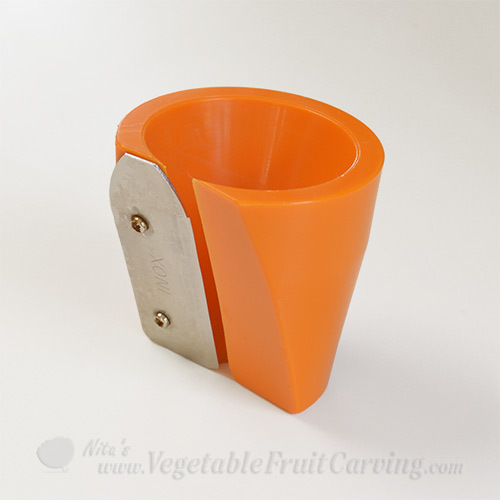 También se puede obtener instrucciones detalladas paso a paso la lección en mi tienda en línea en http://www.vegetablefruitcarving.com / shop. 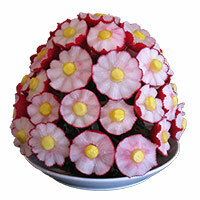 You can get my lessons from my online shop at //www.vegetablefruitcarving.com/shop. You can pay with Visa, Mastercard, Discover card or PayPal. All these methods will change the currency from your currency to dollars. I hope that answers your questions. Let me know if you have any other questions. very amazing and u did a great job. Saw you on Home and Family quite awhile back. You were so pleasant as well as a wonderful fruit carver. I was curious as to where you are from. Do you live in Ca. where there is always wonderful fruit available?Would love to see you work in person sometime other than youtube. Thank you Linda. Yes, I am in California where we have great produce year ’round. Are you interested in lessons?